Russell Brand: Re:Birth (Netflix, December 4) - Russell Brand gets loquacious in London as he ruminates on the state of the world and marvels over how his life changed the moment he became a father. The Ranch: Part 6 (Netflix, December 7) - Set in present day on a Colorado ranch outside Denver, this multi-camera family comedy series stars Ashton Kutcher, Sam Elliott, Debra Winger and Elisha Cuthbert. The show follows Colt’s (Kutcher) return home after a brief and failed semi-pro football career to run the family ranching business with his father Beau (Elliott). Winger stars as Colt’s mother, Maggie, and Cuthbert stars as Abby (Colt's soon to be fiancé). ReMastered: Who Killed Jam Master Jay? : Track 3 (Netflix, December 7) - Run D.M.C legend Jam Master Jay made a huge impact on music and the hip-hop community. Over a decade after his unsolved murder, family and friends investigate to seek out the truth. Who Killed Jam Master Jay? Nailed It! Holiday! (Netflix, December 7) - Hosted by Nicole Byer and Jacques Torres, this holiday-themed competition sees home bakers with a terrible track record take a shot at recreating edible holiday masterpieces for a $10,000 prize. It’s part competition, part hot mess. Pine Gap: Season 1 (Netflix, December 7) - At top-secret U.S.-Australian joint defense facility Pine Gap, fissures appear in the critical alliance as spies work with, and against, each other. Fuller House: Season 4 (Netflix, December 14) - In the spinoff series, Fuller House, life can take you into unexpected directions and also back into familiar territory when veterinarian and recently widowed D.J. Tanner-Fuller finds herself living in her childhood home with younger sister and aspiring musician Stephanie Tanner and DJ’s lifelong best friend/fellow single mother Kimmy Gibbler. The women reuniting to help support one another navigate careers, parenting and relationships with the kind of love and humor you can only get from the people you grew up with. Tidelands: Season 1 (Netflix, December 14) - Follows Cal McTeer (Charlotte Best), a young woman who returns home to the small fishing village of Orphelin Bay after ten years in juvenile detention. But her hometown is shrouded in mysteries, the greatest of which is the commune of outcasts who live in a hidden pocket of the bay: the Tidelanders. Springsteen on Broadway (Netflix, December 16) - A solo acoustic performance written and performed by Tony Award, Academy Award, and 20-time Grammy Award winner Bruce Springsteen. Based on his worldwide best-selling autobiography 'Born to Run,' “Springsteen on Broadway” is a unique evening with Bruce, his guitar, a piano, and his very personal stories. In addition, it features a special appearance by Patti Scialfa. Netflix will allow global audiences to see the show critics have been raving about from anywhere they are. Perfume (Netflix, December 21) - Patrick Süskind’s best-selling novel about smell, passion and serial killing gets a shocking contemporary spin. While in boarding school, a group of six become friends through their intense passion for scent. When one is brutally murdered years later, disturbing secrets about the group are revealed when the police investigates each as a suspect. Selection Day (Netflix, December 28) - With the whole world against them, Manju and Radha get ready for the toughest innings of their life. As the pressures of teenage years and selection day mount, Manju has to choose between what's meant to be and what feels right. A Series of Unfortunate Events (Netflix, January 1) - Based on the internationally best-selling series of books by Lemony Snicket (aka Daniel Handler), the third and final season of the Peabody award-winning Netflix original premieres worldwide January 1, 2019. Starring Emmy and Tony Award-winner Neil Patrick Harris, A Series of Unfortunate Events recounts the tragic tale of the Baudelaire orphans – Violet, Klaus, and Sunny – whose evil uncle Count Olaf (Harris) will stop at nothing to get his hands on their inheritance. Ultraman (Netflix, April 1) - An action drama centered around a man possessing the spirit and DNA of the legendary hero “Ultraman” as he wears a metallic ultra suit and fights against evil. Neon Genesis Evangelion (Netflix, Spring 2019) - The 26 episode series that started it all, Neon Genesis Evangelion, and the two feature films The End of Evangelion & Evangelion: Death (True)2, will stream exclusively on Netflix from Spring 2019! 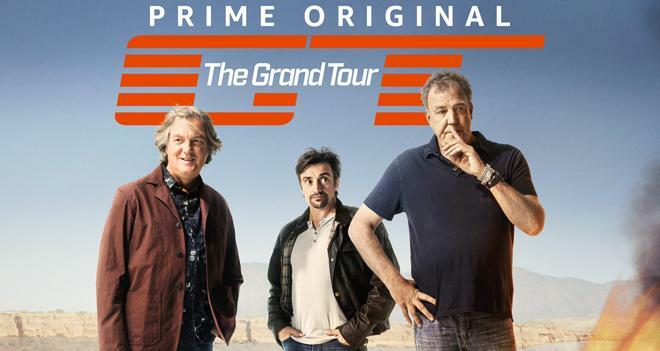 The Grand Tour Season 3 (Amazon Prime Video, January 18) - Jeremy Clarkson, Richard Hammond and James May are back with The Grand Tour. A show about adventure, excitement and friendship... as long as you accept that the people you call friends are also the ones you find extremely annoying. Sometimes it's even a show about cars. Follow them on their global adventure. Future Man: Season 2 (Hulu, January 11) - Future Man stars Josh Hutcherson (The Hunger Games) as “Josh Futturman,” a janitor by day/gamer by night who is recruited by mysterious visitors to travel through time in order to prevent the extinction of humanity.